I grew up in an environment where every kirana (grocery) store was believed to have been owned by a marwari. Whenever we were introduced to a family of businessmen from Rajasthan, it was told they are marwaris. For practical purposes we used this term as a generic word for business community prominently from Rajasthan and it was not important whether the person came from Mewar or Marwar or any other place for that matter. Later in my career I came across some colleagues who belonged to this community and what I observed was that their attitude to life, their dealing with numbers, and their shopping behavior was much different from rest of us. And there were lot of common behavioral reflections in almost all of them. As a student of business and behavior this prompted me to go little deeper into studying their evolution as business community, their general expected behavior and their contribution in developing entrepreneurship and enterprises in India and abroad. I mostly depended on web source and found some interesting papers and publications which gave me a fair idea of their backgrounds. In the series of the story of Indian Business initiated by London School of Economics, I came across this volume written by Thomas A Timberg. His research acumen in tracing the business history keeping the role of marwaris at the center is reflected through the authority with which he narrates the background, regions, spread, transformations in business diversification, family feuds and geographic migration. A detailed foreword by Gurcharan Das provides the background of the author and theme of the book by pinning down minute yet important objects of traditional Marwari business setups, like sakh (goodwill), hundi (negotiable financial instrument), bazaar (market), gaddi (seat), etc. Weber’s bureaucratic structure viz-a-viz., family business structure is discussed in the foreword to distinguish between these two ways of business administration. The foreword is like a chapter on Indian business and its dominating features that are still prevalent in the businesses run by traditional marwaris. I got reminded of the stories that Gurcharan Das had mentioned in his detailed treaty on indian business in the title of India Unbound. This foreword is full of academic importance and should be a must for a student of business in India. Marwaris originated from the region ruled by Marwars in Rajasthan which predominantly consists of people from Shekhawati region however Jodhpur, Bikaner and Jaisalmer are the places of classical marwars. Many times while I have interacted with traders and tried knowing their origin, they have told me about their roots in Jhunjhunu which is another area from where Marwaris migrated to other parts of the country and abroad as well. Many of the marwaris are identified with their surnames as Jhunjhunwala, Singhania, Jaipuria, Ajmeras, Bikaneris etc. The book traces back the role of Indian business during British raj period, and the expansion of marwaris in all parts of the country. Primarily they were in providing service or doing trade activities of all kinds. Their growth during eighteenth and nineteenth century is narrated in this volume with a sense of ownership and authority citing the registers of that time and entries made in different ledgers etc. 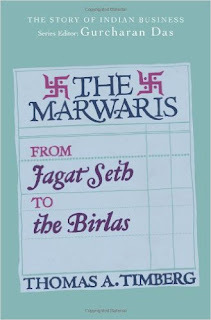 The expanded business of Jagat Seth and their relationship with British rulers find mention in the book at different places. Business, Politics and Society exists in interdependent space be it market, board rooms or parliament. Businesses have always contributed to the cause of social well-being and there are many instances that provide a fair account of influence of dominant business houses on decision making of politicians. It has happened in all geographies of the world and in market economy it is extremely difficult or almost impossible to operate in isolation. The business houses like Dalmias, Birlas, Tarachand Ghanshyamdas, Khetans, Goenkas, Poddars, Bajajs, etc have all contributed to the cause of nation building apart from successfully pursuing their business interests. No other community as a whole can teach you best the art of managing risk other than marwaris. It is in their DNA. Failure does not deter them from getting into new ventures and as time is changing their operating domains are changing as well. They are best opportunity explorers and have tremendous capacity to leverage that opportunity in their stride. However as mentioned in the book they have gone into bureaucracy and also been seen as employees in firms. Their key domains have been managing finance and the records of chartered accountants show that as marwari community they occupy largest share in the market. When we were studying accountancy in our school we learnt Marwari accounting procedures where we used to turn the pages (into 6 or 8 turns) and write typical traditional hindi text. The format of journal and ledger was followed and in some smaller size firms still that is followed. It is mentioned in the book that Birla’s were following unique system of accounting which is believed to have helped them much better in their decision making and they continued with the same till few years back when Kumar Mangalam Birla ordered the change and now they no more practice that traditional accounting. It is worth mentioning here that there have been questions raised as to the evolution of accounting procedures. Though we follow double entry bookkeeping which came into existence in fifteenth century (1494 AD), it has been argued elsewhere that Marwari Accounting system is older than this. 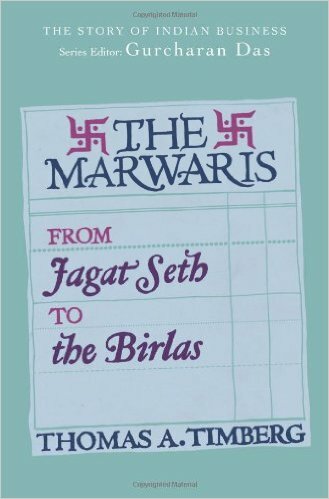 At many places in the book Timberg cites his earlier book written in 1978 in the title of The Marwaris: from traders to industrialists. I searched it and found it in our library which has added lot of value to my thinking on marwaris. As I learn now Timberg is a key authority on the subject as he has pursued this for his doctoral work in 1971. Present book in an extension of his earlier work and carries forward the developments which have happened in last three decades or so. His earlier work was written with more academic rigor, however the present version is straight and follows popular writing style, though there is substantiation of all that he mentions in the title. Now when I meet my Marwari friends I shall be able to relate better with their behavioral dispositions as to why do they behave the way they behave; why their outlook towards life is much different than rest of us; why their general buying pattern and priorities are different. I am better off in my understanding of Indian traders and business, their evolution and expansion pattern and their operational attitude. The business culture has gone into big transformation, it has become more cosmopolitan and universal. Wish that marwaris are able to maintain their culture and their identities do not get mingled and lost and become extinct in the larger business hemisphere.